What is a challenge ropes course? The challenge course industry grew out of a desire to implement a wilderness type experience in a fixed setting, as opposed to the expedition setting. A course is defined as a series of activities, sometimes on or close to the ground (usually referred to as a low ropes course) and sometimes built on utility poles or trees, or in the rafters of a building (a high ropes course). Challenge courses are installed in wide variety of places–schools, camps, park districts, and outdoor education centers, as well as in corporate training centers. Each course can serve a single group, such as students in a school. The single identifying feature is that most often, it is an intact group which comes together to share the challenge course experience, and that a curriculum is designed for the specific outcome desired by that group. The course itself is comprised of many different elements. Names of these elements vary throughout the industry, as do belay systems, access systems, the number of elements at a course and the sequence of the elements. Each course is individually designed and built to accommodate the local terrain, climate, and program delivered at that site. Climbing walls have also become increasingly popular over the last years, partly for recreational purposes, and partly as educational tools. When climbing walls are built for educational purposes, they are often used in conjunction with a challenge course. The Challenge Course is a unique program: it is a high reward, seemingly high risk activity. While there is some risk involved in participating on the Ropes Course, it has been greatly minimized by strict and thorough safety measures. On high elements, for example, participants wear a safety harness system. If they fall, they are suspended in the air by a safety (belay) line. The participants may logically understand that they are safe, but their knees still shake when they are 30 feet up. In other words, the perceived risk is much greater than the actual risk. This is what makes the Ropes Course a mental challenge as well as a physical one. The low ropes elements are structured activities that are literally low-to-the-ground. They are purposefully geared toward team building. A group can participate together in these activities on their own. Safety and spotting techniques are utilized by all participants. Debriefing questions are available to group leaders. The high ropes elements are challenging activities that are literally high-above-the-ground. They are geared more toward individual challenges. Trained facilitators and leaders will guide groups through the high ropes elements. Each ropes course program should have some established goals and objectives. This creates a focus for the program and a deliberate and clear set of expected outcomes. These outcomes can be set by the group, individuals or the sponsoring organization. Provide a fun and safe experience. Provide an appropriate, sequential series of activities / experiences. Create an atmosphere where the participants feel comfortable enough to ‘stretch’ personally beyond self-imposed limits. Every course and group that is run will be different in some way, so a strict set of objectives that everyone must follow may not be the best approach. By giving the group and their leader’s time to reflect and think about what their goals and objectives are for their program is one way to ensure a positive and successful rope/challenge course program. It is a thrilling and fun thing to do. Commitment to perform where there is uncertainty of results is a healthy decision-making process. Proving to oneself that a seemingly insurmountable problem can be overcome is enlightening and satisfying. There is evidence that there is a significant positive carry over from the experience of successfully completing a demanding, fabricated problem as compared to overcoming everyday problems. Getting out there and playing, and enjoying the Challenge Ropes Course is what it is all about. Most of all have fun! It is an incredible process. For Ropes Course Rates, please contact the Site Director at the camp you are attending or interested in. 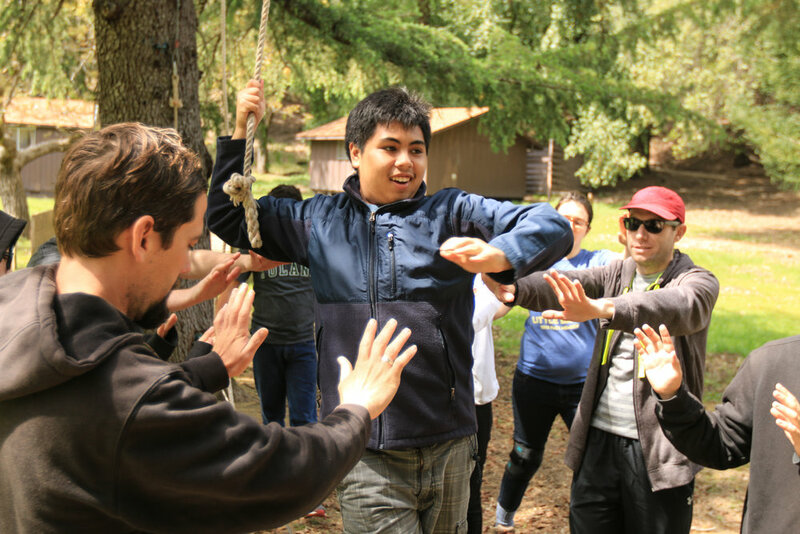 You may also contact Empowering Ventures Inc.
From California's coastal redwood forests to the bluffs of Cape Cod, UCCR offers a diverse array of camp rentals and retreat center rentals that are available to nonprofit organizations, schools, religious groups, and reunions. We are happy to work with you on matching your group’s needs to a camp, conference or retreat facility. Now available to nonprofits for day use or overnight stays, Clover Woods Camp & Retreat Center wants to invite you for a free tour.